I'm a couple months late on these sets but I just got them in last week, so better late than never. 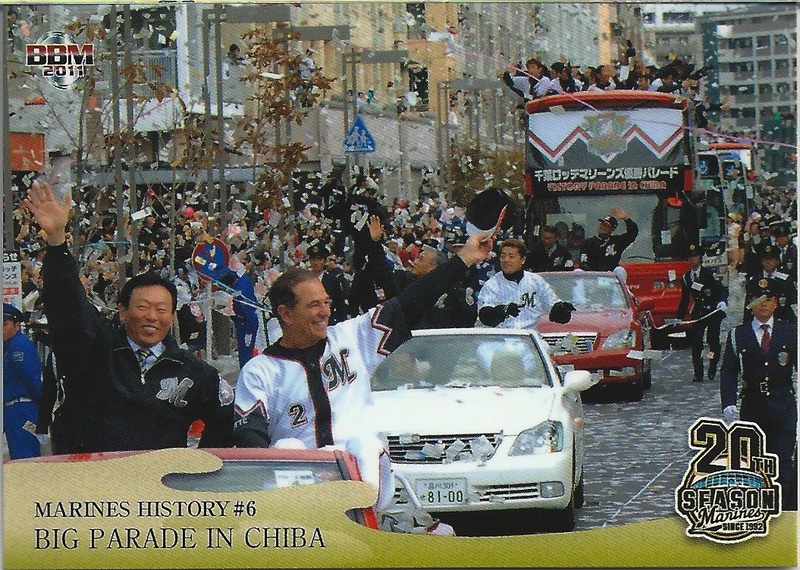 Last season, the Marines celebrated the 20th Anniversary of their move across Tokyo Bay from Kawasaki to Chiba. 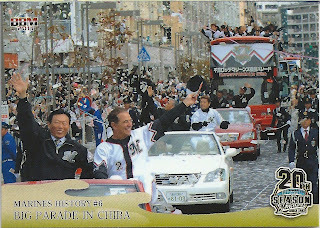 BBM issued a 99 card pack based set in early September to commemorate this. 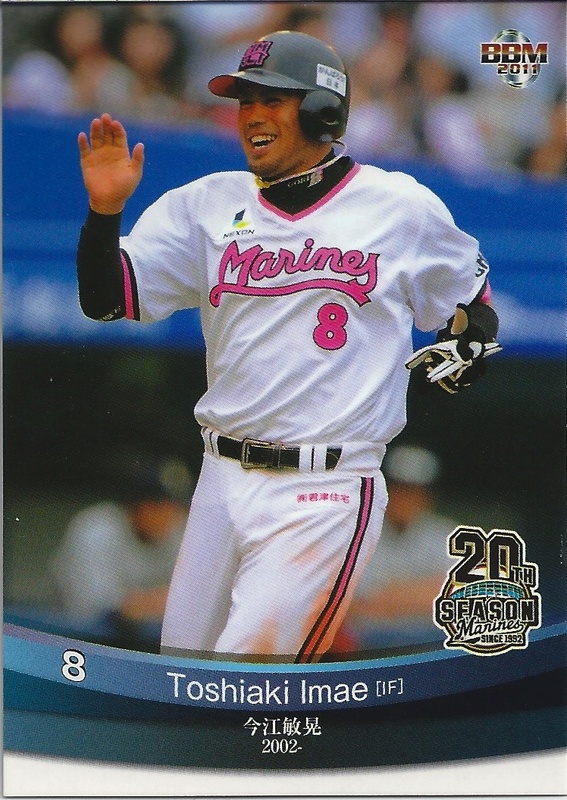 The set leads off with a seven card "Marines History" subset, followed by 28 cards for the 2011 Marines team. 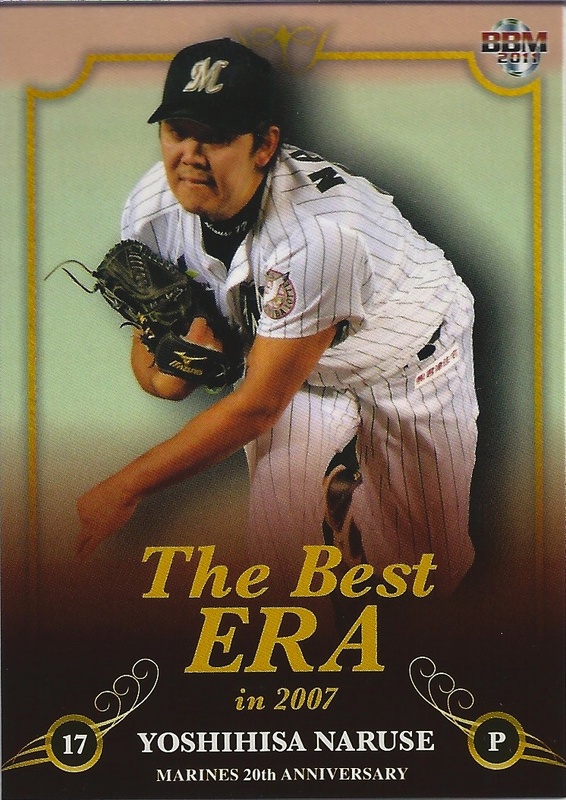 Next is a five card subset featuring the five former managers of the Marines (Akira Ejiri, Akihito Kondoh, Bobby Valentine, Soroku Kagisawa and (the other) Koji Yamamoto). 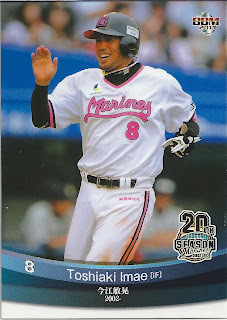 Next is 45 cards of OB Marines players. 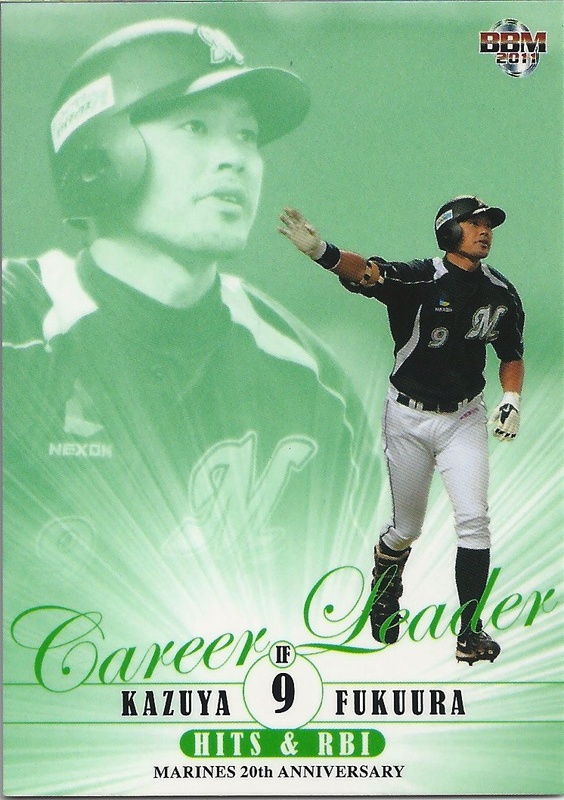 The set wraps up with a five card "Career Leader" subset and a nine card "Title Holder" subset - the latter one featuring Marines players who lead the league in something (or won an award) in a single season. 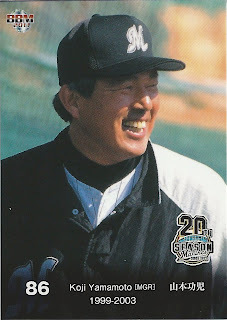 The 28 current Marines includes the manager (Norifumi Mishimura) and six guys who didn't make the 2011 BBM 1st or 2nd Version set (as Marines) - Jose Castillo, Makoto Imaoka, Naoki Matoba, Tadahiro Ogino, Yuta Ohmine and Tomohisa Ohtani. 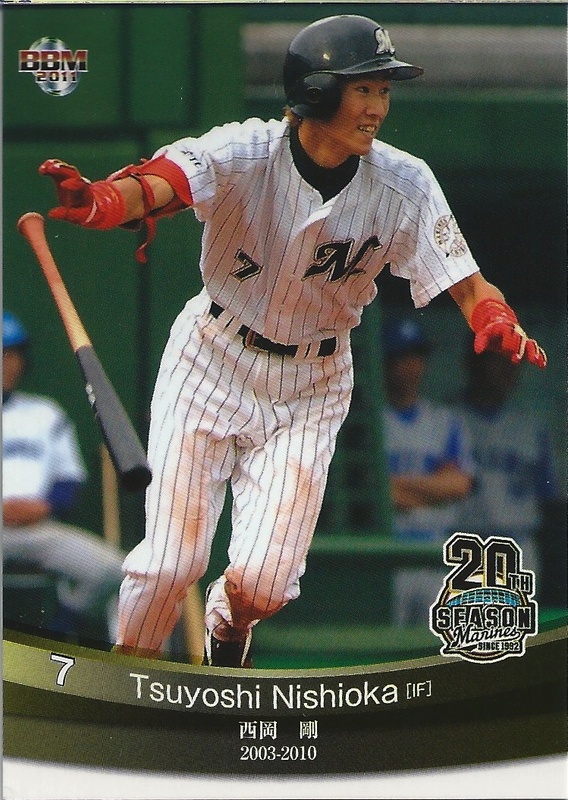 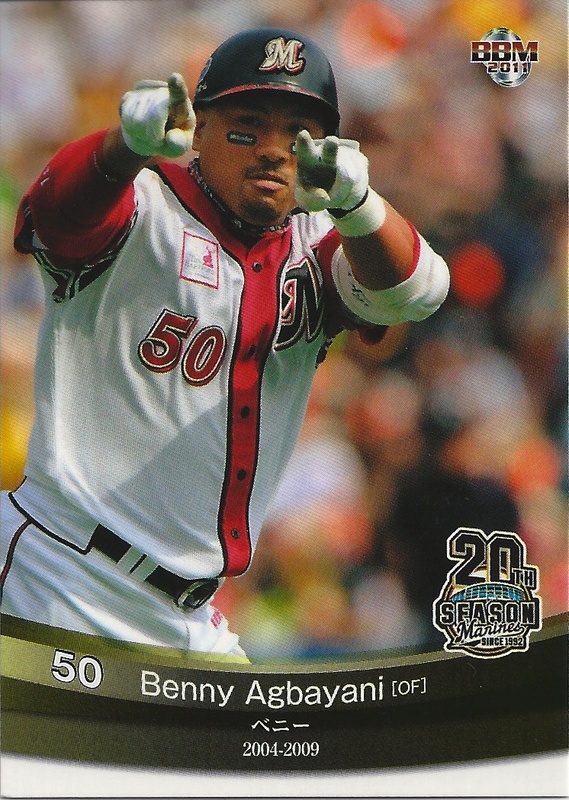 The 45 OB players (as usual) includes both retired players and active former Marines - including Saburo, who was traded from the Marines to the Giants mid-season last year. Other players in the subset are Benny Agbayani, Frank Bolick, Julio Franco, Koichi Hori, Hideki Irabu, Masahide Kobayashi, Satoru Komiyama, Tomohiro Kuroki, Seung Yuo Lee, Nate Minchey, Tsuyoshi Nishioka, Brian Sikorski, and Brian Warren. There's no one obvious to me that is missing, but I certainly could have missed someone.